- Find the definition of transversal in your special notebook. - You should have a special notebook entry for Transversal Angle Pairs that looks something like the image above. It should go up front after the Corresponding Angles Theorems. - When a transversal intersects 2 other lines, we give names to certain pairs of angles because they are special! Our goal is to figure out what the names mean and how to identify the different types of angle relationships. This will help you reason and draw diagrams. - Could you draw a diagram and analyze the Consecutive Interior Angles relationship? After this activity, you'll be able to! Above is an applet for doing geometry. An applet is just a simple app. Interact (play around) with the applet for a minute or two. Drag various lines around and click checkboxes until you understand how to use the applet efficiently. You will be figuring out what all the angle pairs are and what their names mean, then you will record that information in your daily notebook. In your daily notebook make a table for identifying each Angle Pair Type from the applet with a type of angle from your Transversal Angle Pair special notebook entry. Notice the new angle pair! Add it to your special notebook entry about Transversal Angle Pairs. Reply to the prompts below in your daily notebook. 1) What does the term "consecutive" mean in the phrases "consecutive interior angles" and "consecutive exterior angles"? 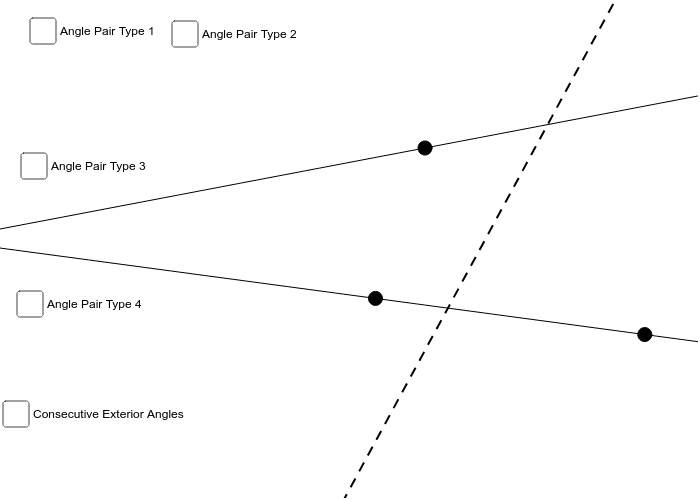 Your response can began like this: "1) When a transversal crosses two lines, the consecutive angles are the ones __________________________________" 2) What does the term "alternate" mean in the phrases "alternate interior angles" and "alternate exterior angles"? 3) What does the word "interior" mean in the phrases above, and how many interior angles are there? 4) What does the word "exterior" mean in the phrases above, and how many exterior angles are there? 5) Describe what makes two angles corresponding in the situation above. Transversals and Parallel Lines Notice that not all transversals cross parallel lines. However, when the lines are parallel, some really exciting and important relationships occur! 6) Find the definition of Parallel in your special notebook. 7) Construct a pair of parallel lines crossed by a transversal in your daily notebook. Measure all the angles formed by the intersection of the transversal with the parallel lines. 8) Clearly state the relationship between the measure of the two angles for each type of angle pair.